Culture Shift Dubai - Promo from Flux Video on Vimeo. Culture Shift is the British Council’s global innovation programme. 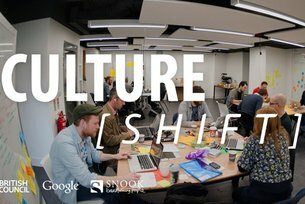 A Culture Shift Lab is similar to a hack weekend - business ideas are generated and tested over a short period of time by designers, developers, innovators, individuals and groups from the local cultural sector. For the UAE, this is an exciting time for the arts and creative economy, with countries in the region investing more money in arts infrastructure, venues, start-up businesses and events. There is currently a huge audience of young people in the region who have an appetite for exhibitions, live performances and theatre, but who also regularly look to digital media for inspiration. With every lab we set up a core focus or theme that supports the development of ideas from participants. For Dubai, we wanted to look at how we can aid the expansion and development of grassroots activity in the creative sectors and look to how digital can transform this in the coming years. Snook have worked with the British Council over the last 4 years to support their Culture Shift model around the globe and, every time we run a lab, the weekend and outcomes are very different. We kicked off in our wonderful arts studio venue, JamJar, on the outskirts of the city, with wise words highlighted by Devon Walshe from Open Glasgow. ‘Most value has nothing to do with money,’ he said , as he asked the participants to think about how they create value within the ideas they were about to develop. So often at hack events, ideas can be pushed through a funnel of ‘what’s the business model?’. While this is important to create sustainable ideas, it was great to pose the question of what value really is. We'd collected ideas from participants which were turned into open themes, ranging from: how can we increase access to modern manufacturing equipment (i.e 3D printing) in Dubai to open up the production processes for business, to how can we better support grassroots and smaller art organisations to advertise and grow audiences in Dubai? After the open session we had what we, at Snook, like to call 'Fight Club', but without the fighting! It’s a circle where people take the opportunity to pitch an idea and allow other participants to choose to form a team with them. This is the most difficult part of the process, as often many people are unsure about what they would like to work on. We emerged with six teams that worked together throughout the weekend. We presented a journey map to show that, whilst everyone will feel great at the very start, the middle of the process is going to feel tiresome and slow. This is the point where groups are working out what it is they want to build and create, and when you have new personalities and networks working together, there’s much to overcome before the idea can emerge. We consider arguments as healthy debate and a natural part of any creative process. It’s important a team’s values are on the table first. On day 2 it was heads down into the task and the opportunity to play with LittleBits and Makey Makey. These are fantastic tools for creating small mini-hacks that get people playing with technology and expand their knowledge of what really is possible, even at a simple level. The final day- judgement day - approached quickly. We found the Dubai teams to be quite self-sufficient at creating presentations and pitches, which hasn’t always been the case across our global work. In particular, each team had really gone to the effort of ensuring they’d done some market research, also having a substantial amount of survey data and qualitative interview material to back up their concepts. My Creative Dubai - A newly developed network and platform bringing together content from grassroots movement around the city. All housed under one hashtag #mycreativedubai. The power of this network was clear to see and by Sunday they had already set up a platform with key leaders backing the network. Culturescape - An arts open-platform to give arts and cultural events a platform to advertise in UAE and map their cultural impact. The judges felt the winners together offered a unique proposition of grassroots network and events listings to really surface the activity going on currently under the radar. For me, it was interesting to see both a non-technical and technical winner both take first place. I’m personally really excited to see where My Creative Dubai goes as a united front and particularly pleased that examples from Creative Edinburgh and Creative Dundee supported them to develop their thinking.